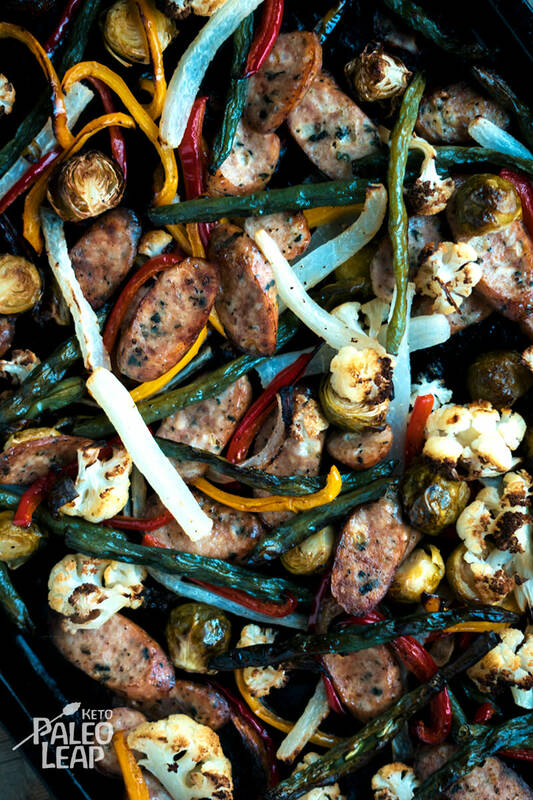 “Let’s skip pizza night, and bake this panful of sausage and veggies instead…” said no one ever, until today. While there is nothing wrong with consuming the right kind of pizza, there is never any good reason not to eat a medley of vegetables loaded with your best-loved sausage. As you get your grocery shopping done this week, make sure to toss some bell peppers, Brussels sprouts, green beans, onions, cauliflower and a daikon radish into your cart. Daikon quite literally means “big root” in Japanese. You may or may not have tried it yet, and if you belong to the latter group, this is a great meal to sample it in, as there are so many flavors and textures going on. These large radishes are more mild and less peppery than their commonly red counterparts that we love in salads. When baked, the daikon radish tastes quite like turnips, but it can also be eaten raw to experience its delightful tangy and crispy characteristics. To clarify the butter situation, clarified butter and ghee are not exactly the same thing. It’s a long story, but the gist of it is that clarified butter is pure butterfat, and ghee is clarified butter which has been cooked further, until the milk solids start to caramelize. Good news is, that, for the most part, they can be used interchangeably. If you are into making desserts, or herb butter, then ghee is a good thing to have in your pantry! In a bowl combine the clarified butter, olive oil, Italian seasoning, paprika, and season to taste. Place all the vegetables on a baking sheet. Drizzle the olive oil mixture over the vegetables and toss gently. Add the sliced sausages on top of the vegetables and place in the oven. Bake in the oven 25 to 30 minutes, turning the veggies and sausages at the halfway point. Let rest 4 to 5 minutes; serve warm.